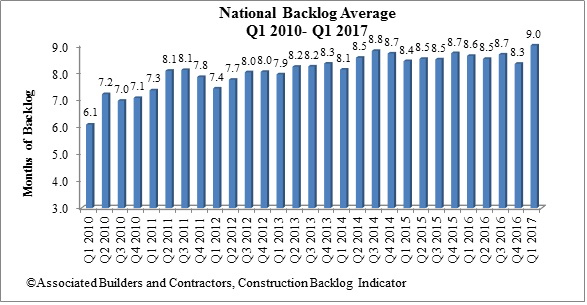 Associated Builders and Contractors (ABC) has reported that its Construction Backlog Indicator (CBI) rose to nine months during the first quarter of 2017, up 8.1 percent from the fourth quarter of 2016. CBI is up by 0.4 months, or 4 percent, on a year-over-year basis. “This was a terrific report,” said ABC chief economist Anirban Basu. “For the first time in the series’ history, every category—firm size, industry and region—registered quarterly growth in CBI. 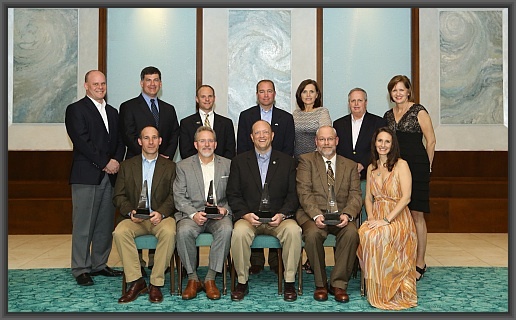 Among the big winners were firms in the western United States and those with annual revenues between $30 million and $50 million per annum. 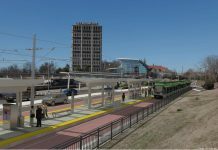 “However, some contractors have expressed concerns regarding construction conditions in 2019 or 2020,” said Basu. “These concerns are rooted in a number of factors, including the already lengthy duration of the economic recovery, evidence of saturation in certain commercial real estate markets, weak momentum in numerous public spending categories and tightening monetary conditions. However, first quarter 2017 CBI strongly suggests that rumors of the business cycle’s demise are exaggerated, at least thus far. Surging financial markets helped support activity in financial centers like New York, Philadelphia and Boston. Expanding cyber-security and life sciences activity supported markets as geographically diverse as Washington/Baltimore; Austin, Texas; Silicon Valley, Calif., and Seattle. Though backlog is slightly lower in the South on a year-over-year basis, it continues to report the lengthiest backlog, at 9.8 months. A number of markets remain extraordinarily active with respect to commercial construction, including Atlanta and Miami and Tampa, FL. Distribution center construction also continues to be active due to a combination of busier seaports and the ongoing online retail boom. Backlog in the West was up by a remarkable 26 percent during the quarter. Part of this was due to statistical payback after a surprisingly weak fourth quarter. However, this is also a reflection of the rapid commercial growth in Seattle, Denver, Silicon Valley, San Diego, Phoenix and other population growth hotspots. Higher oil and natural gas prices helped to drive CBI higher in the Middle States. Backlog in the region expanded by a more-than-respectable 10 percent during the first quarter, and now stands at a healthy 8.5 months. Chicago continues to be a weak spot, however, registering slow job growth relative to other major U.S. metropolitan areas in recent quarters. Backlog in the Northeast rose to 8.7 months during the first quarter. Backlog is up by almost precisely half a month over the past year. The New York and Boston metropolitan areas remain particularly active. 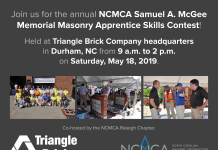 Backlog in the commercial/institutional segment rose by more than 11 percent during the first quarter, and now stands at nearly 9 months. Backlog also expanded in the heavy industrial and infrastructure categories during the first three months of the year. Average backlog in the heavy industrial category rose to 5.88 months, but remains well below levels registered during much of the history of the series. Excluding the fourth quarter of 2016, this represents the lowest reading since the fourth quarter of 2014. There are many forces at work, including slowing auto sales, downward pressure on prices in a number of key manufacturing segments and soft exports. Backlog in the infrastructure category expanded during the first quarter and remains above historic levels. Actual infrastructure spending has been unimpressive in many categories recently, including wastewater, water supply, dams/levies and highway/street. Available survey data hint at a bit of a pickup in activity during the quarters ahead. 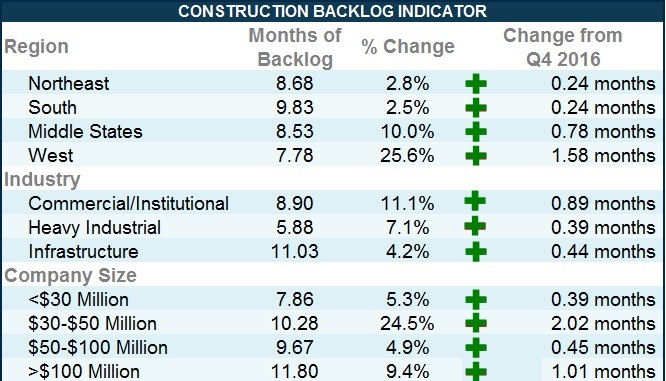 Commercial/institutional backlog expanded to 8.9 months, matching its highest level since the third quarter of 2014. 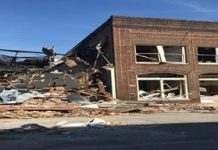 Though there are growing concerns regarding overbuilding in a number of metropolitan areas, and retail stores continue to close in large numbers, increases in office and hotel construction are helping to propel this category forward. Backlog for each of the four company size categories increased to start the year. Firms with revenues of $30 million to $50 million, many of which are in the commercial/institutional segments, were the clear outperformers in terms of expanding backlog during the first quarter of 2017. 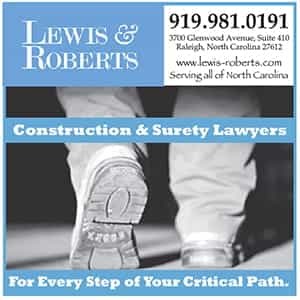 Backlog for this group of firms expanded by more than two months, indicating growing confidence among developers and other purchasers of construction services. Backlog among firms with annual revenues of less than $30 million increased by 5.3 percent during the quarter. 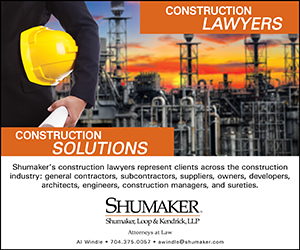 Over the course of time, the nonresidential construction recovery has broadened enough to encompass many of the smallest firms. The largest firms, those with annual revenues above $100 million and which are disproportionately represented in the infrastructure category, report the lengthiest backlog at 11.8 months. This was up by more than 9 percent during the quarter. Backlog for this group is approaching the one-year mark, which is considered to be a sign of significant health. CBI is a leading economic indicator that reflects the amount of construction work under contract, but not yet completed. 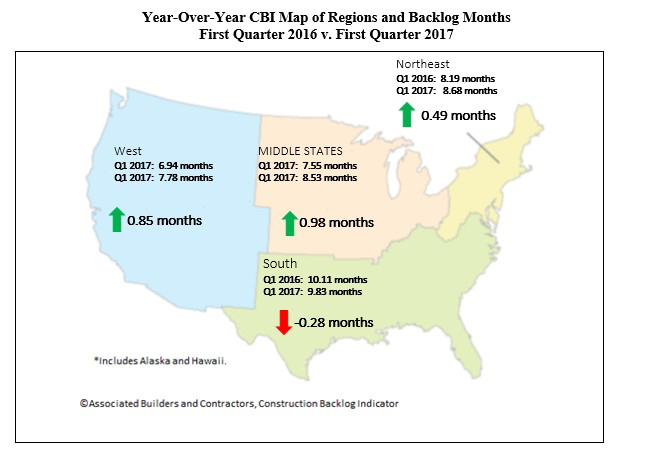 CBI is measured in months, with a lengthening backlog implying expanding demand for construction services. More charts and graphs are available on abc.org.